Finally did fly. Butch Harbold's Sequoia 300 took to the air the other day. Butch reports it flies quite well and "handles like a Falco". The airplane was started in 1978, so that's about 19 years from start to finish-for an airplane that we once hoped would be quick to build, back when everyone thought that 'fiberglass' meant 'quick build'. When asked about this, Sequoia President Alfred Scott replied, "Well... er... um, I think... well... gee whiz... I didn't know that... oh, kiss off!" Don't let anyone ever tell you that making a fiberglass fuselage shell mold is an easy thing. And actually there were a few extenuating circumstances, beyond our own tardiness. There were a number of people who 'worked' on the airplane along the way and who created more problems than anyone should be saddled with. It fell to Gar Williams and Charles Gutzman to fix these things, including a 10-inch engine mount stretch to compensate for an airplane that was unbelieveably tail-heavy due to added gussets and the use of 1/4" steel in the tail when .063" was called for. Bad dog. The British Airways baggage handler was distressed to see, when he removed a dog carrier from the cargo hold of a 747 recently, that the dog had died. The resourceful man rushed to a nearby dog pound and found a mutt that looked to be identical, so he switched them and rushed back to the terminal. "That's not my dog! ", the lady said when seeing it for the first time". "How can you tell? ", he asked. "My dog's dead. I was shipping him back home to bury him." On heavily-borrowed words. Oh, I have slipped the surly bonds of earth and danced the sky on laughter-silvered wings... So begins one of aviation's most famous poems, High Flight, a sonnet by a young American pilot, John Magee, who was one of the first Americans to be killed in WW2. However, recent research by Englishman Tony French reveals that many of the words were borrowed, or have stunning similarities with words in other poems published in Icarus-an anthology of the poetry of flight, published by Macmillan in 1938. Magee wrote High Flight in 1941. For example, in an earlier poem New World, G. W. M. Dunn wrote With zest we soar on laughter-silvered wings/ From fevered ways, panic and petty deeds. From the same poem, Dunn's hushed limbs and the lifting mind becomes Magee's silent, lifting mind. Dunn refers to the shouting of the air, while Magee has chased the shouting wind. Magee's surly bonds of earth are close to Dunn's earth fetters and the shackling sea. Magee's next-to-last line talks of high untrespassed sanctity of space, which bears close resemblance to the already published line Across the unpierced sanctity of space. Magee's danced the skies echoes another poem which contains I have danced the streets of heaven. I am blind: I have never seen/ Sun gold nor silver moon,/ Nor the radiant noon. They speak of the dawn and the dusk,/ And the smile of a child,/ Of the deep red heart of a rose,/ As of God, undefiled. But I learnt from the air today/ (On a bird's wings I flew)/ That the earth could never contain/ All of the God I knew. I felt the blue mantle of space,/ And kissed the cloud's white hem,/ I heard the stars' majestic choir,/ And sang my praise with them. Now joy is mine through my long night,/ I do not feel the rod,/ For I have danced the streets of heaven,/ and touched the face of God. But let us be kind. Magee died in a training accident shortly afterwards. He was 19 years old. All writers begin by imitating others and only find their own voice after years of writing, so it's only natural that a homesick boy suddenly off at war would try his hand at poetry by first borrowing and improving on the work of others. And there's no way the young pilot could ever have known what fame would attach to the poem. Was it Edison who said, "Good designers borrow. Great designers steal."? So it goes for words, when you are 19 and far from home. Besides, no matter who wrote the lines, what better words are there to end the poem but Put out my hand and touched the face of God? Grand Unchampion. This is "The New Delhi Spirit of the Great Unwashed Compaso d'Oro" awarded to The Corporate Disgrace years ago by Dave Aronson. 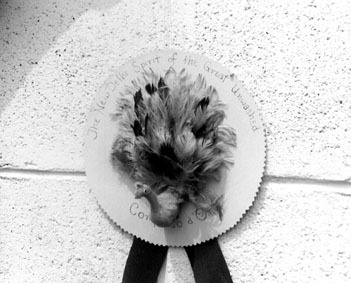 It features perhaps the nastiest-looking bird you ever saw, a recycled hat ornament, if you can imagine such a hat. There's nothing like a typo in an advertisement to blow your image. Take a look at the ad in the inside rear cover of the July Flying for a full page ad on the Jetcruzer 500, wherein ultimate is spelled "ultilmate", fuselage is spelled "fusealage" and pavilion is spelled "pavillion". Oh well, it was Ms. magazine last summer that spelled feminism incorrectly on the cover. Sheesh. Remember little Jessica Dubroff, the seven-year-old who was attempting to set a record as the youngest person to fly across the country? She was killed with her father and flight instructor shortly after departure from Cheyenne, Wyoming, during stormy weather. Now there's a foundation established in the name of Jessica which has sued Cessna and Lycoming for negligence in the design of the 1975 Cessna Cardinal. However, the plane was delivered 22 years ago and the recently enacted statute of repose clause of the General Aviation Revitalization Act limits manufacturers' liability to 18 years, so it's likely this lawsuit will go nowhere. Leper Colony. One of the realities of the aircraft business for the last 10 years has been that suppliers treat you like a leper when they hear the word 'aircraft'. Indeed, many companies simply will not sell parts to anyone in the aircraft business, but within the aircraft business and for aircraft parts, that's never been a problem. 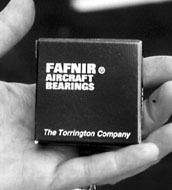 However, the other day we placed an order for some Fafnir bearings. The bearings are for aircraft, indeed on the package it clearly says "AIRCRAFT BEARINGS" in large, bold type. However, before we could buy them, we had to assure our local bearing supplier that the parts were not going into an aircraft before they would sell them to us. What other use Sequoia Aircraft would have for 50 aircraft bearings is beyond us, but that's the way the world turns these days. Udderly ridiculous tale. Nobody believed the crew of the Japanese trawler which sank in the Sea of Japan. Their story seemed utterly preposterous -- that a cow had fallen on the ship out of the clear blue sky, punched a hole in the hull of the ship, and that's what caused the ship to sink. Yeah, right, and what had you been drinking at the time? However, a couple of weeks later, confirmation came out of Russia that the crew of a military cargo jet had stolen a cow they found on a Siberian airfield and loaded it on for the flight home. While cruising at 30,000 feet, the cow became terrified and ran amok, so the crew lowered the cargo ramp, and it jumped out. A Falco took the Grand Champion Award (Plans Built) once again at the Popular Flying Association Rally at Cranfield and also the Pilot Magazine Trophy for Concours d'Elegance. It was G-OCAD, built by Clive Garrard, Gordon Blunt and David Nowill from Leicestershire. Five and a half years abuilding, first flew 21 December '96. Truly faultless, perhaps even better than Stuart Gane's (which has been rebuilt and awaits its second first flight). Pilot wasn't in any way involved in the judging, but I was rubbernecking incognito when one of the Falco's builders caught me sighting along the wing. "You bugger! I know what you're up to. You're looking for the ribs!" he challenged. He was right, but they were only just visible if you really looked hard. The most commonly heard remark at the PFA Rally prior to judging was, "If you want to see the champion homebuilt, don't bother to look any further than that Falco." It was the talk of the show, and rightly so in my estimation, though as a Frati-freak, I'd have to admit to a certain bias. Carla Bielli reports that Richard Thompson was prescient in his 'Leonardo da Frati' cartoon in Air & Space. In May, Stelio Frati was awarded the 1997 Leonardo da Vinci award by the Italian Association of Industrial Engineers to recognize Mr. Frati's work as an aircraft designer. 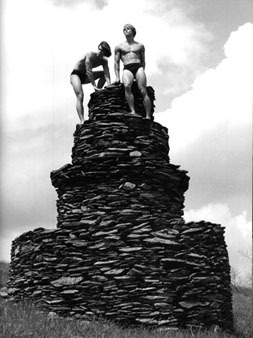 My grandfather built a rather famous house on the top of a mountain near Charlottesville, Virginia, and it's now jointly owned by a hundred or so decendents. This spring we were approached by a fashion designer we'd never heard of who wanted to rent the place for a week to shoot his fall advertising campaign. It was all great fun, they came and went. Then in July, the designer was shot in Miami, and suddenly everyone in the world knows him. Hard way to get name recognition, but watch the current magazines for Versace and Versus labels. Turbulent teats. You would expect that female swimmers, with their smoothly curved profiles would be able to slice through the water more efficiently than their male counterparts, and to an extent, they can. However, these curves can present some hydrodynamic problems as well. A woman's breasts create turbulence in their wake, and this wastes energy and slows the swimmer down. However, you'll be happy to know that Mizuno, Japan's largest manufacture of sporting goods has come up with a solution that's borrowed from aviation. Mizuno has developed a bathing suit with vortex generators on the down-stream side of the bustline, where the laminar flow becomes unstuck. The tiny vortex generators cause the flow to be held tightly to the surface. In addition, the bathing suits are treated with a water repellant to further reduce the swimsuit's friction. Mizuno calculates that these measures produce 9.5% less drag than a conventional swimsuit. The end of Tony's Falco. Tony Bingelis's Falco recently came to a splintery end in a landing accident at the Watsonville, California, airport. The Falco had just been completely gone over with a new panel, autopilot and engine. And the IO-320 has been boosted up so that it produced 198 hp on a dyno. On short final, Courtney Graham, the new owner, advanced the throttle and the engine stumbled as if flooded and put out less power, not more. Had they been over the runway, Courtney says, it would simply have been a hard landing, but they were just short of the runway end. They settled into the localizer antenna, which sliced the plane to pieces. Courtney and his passenger stepped out of the plane with neither a scratch nor a bruise. Congratulations to Jonas Dovydenas for Second Prize in the General category of the 1997 Aviation Week and Space Technology Photo Contest. The winning photo is from the tail of his Falco while over Lake Powell, and it is very similar to the one printed in "The Five Hundred Dollar Burger" (June 1997 FBL). The awards will be announced in the December 22/29, 1997, issue of Aviation Week. It's a small world. No one was more surprised to see the Versace ads on the pages of the September Falco Builders Letter than Andrea Tremolada of Milan, Italy, where he is a Falco builder at night and Versace advertising manager by day, in charge of an $88 million advertising budget. Andrea's Falco is taking shape quickly (he has a few helpers), and he also also owns an SF.260 and a Stampe. He's just sold his production Falco which will be replaced with the Falco he's building now. U.S. Health policy. Legislation introduced by Democrat Rep. Fortney "Pete" Stark of California (H.R. 2784) would amend the Social Security Act to limit the ability of physicians to demand more money through private contracts during periods in which the patient is in an exposed condition. (h) at any other time that the Secretary determines that a normal human being would find it awkward to negotiate a contract."